They have a place in jumpstarting weight loss and improving metabolic health. Meal replacements have created controversy over whether they're effective alternatives to low- or reduced-calorie diets or whether they're simply attractive gimmicks. The products have undergone a metamorphosis and tremendous expansion over the last 50 years—yes, they've been around that long. For anyone old enough to remember, first there was Mead Johnson's Metrecal in a can, available in flavors such as chocolate, vanilla, and strawberry. In the 1960s, the idea of a ready-to-eat liquid meal was revolutionary. Drink this meal in a can in place of a regular meal and lose weight. Ensure came a decade later in 1973, marketed as a supplement to a nutrient-poor diet rather than a weight loss aid. The category now has expanded to the point where consumers can choose from high-protein, low-calorie, high-calorie, vegan, or organic meal replacements in flavors that range from nectar to cappuccino and spiced chai, designed to manage blood sugar, aid weight loss, or boost nutrient intake. Founded in 1980, Medifast alone has more than 70 meal replacement options from which to choose, including bars and prepackaged calorie-controlled meals, leaving no excuses about the lack of availability of foods that fit into a diet plan. Meal replacements are defined as any food that's eaten or drunk as a substitute for a meal or part of a meal. They provide a prepackaged meal with a defined amount of energy and nutrients, although these vary greatly among products. They can replace one meal (a breakfast on the go) or be the sole source of nutrition, consumed as often as five or six times per day. While most provide about 150 to 200 kcal, some offer more than 400 kcal each. 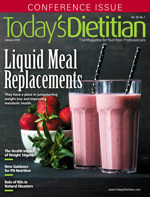 This article focuses on liquid meal replacements. Meal replacement formulas offer clients and patients a premeasured amount of food with specific calorie, protein, and nutrient levels, eliminating the need to weigh, measure, or estimate portion sizes. Liquid meal replacements in a can or a bottle are easy to transport; no preparation or clean-up is required, and some products need no refrigeration. There's research to suggest that the monotony of consuming the same type of meal replacement with a similar texture each day leads to "sensory-specific satiety," ie, the decreasing pleasure of tasting, smelling, or eating a food until full or satisfied.1 The result of the monotony can be reduced appetite and fewer calories consumed. Jacqueline Craig, MS, RDN, CDE, clinical research coordinator at the Cincinnati VA Medical Center, says that in addition to being convenient and easy to use, products like Glucerna are helpful for stabilizing blood sugar. Jessica Crandall, RDN, CDE, AFAA, a spokesperson for the Academy of Nutrition and Dietetics (the Academy) and wellness center director at Denver Wellness & Nutrition by Sodexo, agrees. "For clients who have had their brains fixated on food for so long, these liquid meal replacements can work." Liquid meal replacements often are short on fiber and don't provide all of the phytochemicals found in plant-based foods. Crandall notes that one of the downsides to liquid meal replacements is that for some the transition to real food can be especially difficult. "They may have a lot of fears about reengaging with food," she says. A critical aspect of long-term weight management is education—learning to estimate portion sizes of real foods and translating that knowledge into smaller serving sizes for meals and snacks. Unless a strong support system is provided, she says, that won't be a part of the learning curve and problems can occur when real food is reintroduced, especially if liquid meal replacements are the sole source of nutrition. While research suggests sensory-specific satiety can be beneficial for some, the flavor/texture monotony may be a negative aspect of liquid meal replacements for others. Some liquid meal replacements contain sugar alcohols, which can cause bloating and diarrhea in some individuals. Some contain artificial sweeteners, which may be a deal-breaker for certain clients. In addition, liquid meal replacements can be expensive, depending on how many are consumed daily. If one drink simply replaces breakfast, cost is unlikely to be an issue. However, many liquid replacements provide about 150 to 200 kcal each and cost anywhere from $1.25 to more than $4 per serving. Even a very low-calorie diet (600 to 800 kcal per day) would require three to five meal replacements per day. Many studies that have been designed to evaluate the efficacy of meal replacements for weight loss and determine whether they improve health parameters have been sponsored by companies that sell meal replacements or written by their employees or consultants. But not everyone sees that as a problem. "Many are too quick to dismiss research that has been sponsored by companies," says Angel Planells, MS, RDN, CD, a Seattle-based dietitian and spokesperson for the Academy. "Just because it has a company's name on it, [this] doesn't mean the data are tainted. We should take a bit of time to review the research and come to our own conclusions." 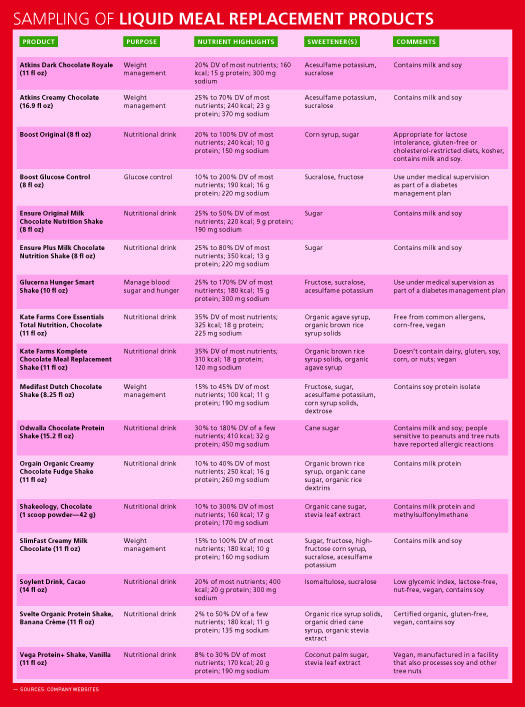 If it's determined that a liquid meal replacement is a workable option for a client or patient with diabetes, it's important to bear in mind the sugar content of these products. Experts have expressed concern about the use of liquid meal replacements in treating obese patients with type 2 diabetes because of the sugar content of some of the products.5 However, one 12-week study of 75 obese subjects with type 2 diabetes found that liquid meal replacements were safe and effective weight loss tools for this population and resulted in significant improvements in not only body weight but also glucose and lipid levels. There also were reductions in insulin and hemoglobin A1c. However, Craig says that cost is an important factor. "Many of my patients can't afford these specialty drinks." However, clients can order some products in bulk, which usually reduces the cost. Ingredients in liquid meal replacements vary greatly. If a client or patient wants to avoid sugar, artificial sweeteners, gums, gluten, or chemical-sounding additives, or limit fat, be sure to read labels carefully before recommending them. Fat content, for example, ranges from about 10% to 50% of calories. In addition, some products, such as Atkins shakes, come in two sizes with significant nutrient differences: The 11-oz variety has 160 kcal, while the 16.9-oz variety contains 240 kcal. How long one should stay on liquid meal replacements varies from person to person and depends on the goals set. "I had one client go six months on meal replacements, lose weight, and then one day said 'enough' and moved on to eating regular foods," Planells says. He recommends allowing clients to try liquid meal replacements for four to six weeks, see how they feel, and go from there. "It ultimately comes down to personal preference and your strategies to navigate food intake throughout the day," he says. 1. Raynor HA, Niemeier HM, Wing RR. Effect of limiting snack food variety on long-term sensory-specific satiety and monotony during obesity treatment. Eat Behav. 2006;7(1):1-14. 2. Craig J. Meal replacement shakes and nutrition bars: do they help individuals with diabetes lose weight? Diabetes Spectrum. 2013;26(3):179-182. 3. Heymsfield SB, van Mierlo CA, van der Knaap HC, Heo M, Frier HI. Weight management using a meal replacement strategy: meta and pooling analysis from six studies. Int J Obes Relat Metab Disord. 2003;27(5):537-549. 4. Ditschuneit HH. Do meal replacement drinks have a role in diabetes management? Nestle Nutr Workshop Ser Clin Perform Programme. 2006;11:171-179; discussion 179-181. 5. Yip I, Go VL, DeShields S, et al. Liquid meal replacements and glycemic control in obese type 2 diabetes patients. Obes Res. 2001;9(Suppl 4):341S-347S. 6. König D, Deibert P, Frey I, Landmann U, Berg A. Effect of meal replacement on metabolic risk factors in overweight and obese subjects. Ann Nutr Metab. 2008;52(1):74-78. 7. Coleman CD, Kiel JR, Mitola AH, Langford JS, Davis KN, Arterburn LM. Effectiveness of a Medifast meal replacement program on weight, body composition and cardiometabolic risk factors in overweight and obese adults: a multicenter systematic retrospective chart review study. Nutr J. 2015;14:77. 8. Franz MJ, Bantle JP, Beebe CA, et al. Nutrition principles and recommendations in diabetes. Diabetes Care. 2004;27(Suppl 1):S36-S46.